Media - Back Lot Productions, Inc.
July 28, 2011 — Schlotzskyʼs today announced it has named Back Lot Productions, Inc., an Atlanta-based company specializing in retail design and brand development, as its Vendor of the Year. Back Lot Production owners, Bart Mills and Tracey Barker, were recognized with the prestigious honor for their creation of the Schlotzskyʼs ʻLotz Betterʼ prototype design. The first new Schlotzskyʼs ʻLotz Betterʼ prototype opened in Waco, Texas, in 2010 and was so well-received by customers that Schlotzskyʼs corporate executives made the decision to reimage all of its existing 350 restaurants with the same ʻLotz Betterʼ design. Mills, an architect by trade, and Barker, a graphic designer, focused on the unique shape of Schlotzskyʼs round bun and created a fun, quirky, and unique look. Additionally, they designed the new logo that incorporates the circle concept. All the new packaging in restaurants, updated business cards, and stationary, as well as the bright, vibrant color scheme was integrated by the duo. Kansas City marked the first market to kick-off Schlotzskyʼs nationwide reimage initiative in March 2011 with four locations adapting the new ʻLotz Betterʼ look. Since then, restaurants throughout Colorado, Georgia, Louisiana, Texas, and Washington have revamped with vibrant colors, playful slogans, contemporary furniture and artwork. Schlotzskyʼs also has introduced a new service model where crew members hand-deliver food to the tables. With more than 350 locations worldwide, Schlotzskyʼs continues its growth momentum by aggressively targeting markets in Texas and in untapped markets around the country including Charlotte, North Carolina; Denver; Tampa, Florida; Orlando, Florida; Kansas City, Missouri; Nashville; Phoenix; Raleigh, North Carolina; and St. Louis for multi-unit developers. Roddy added that, ideally, Schlotzskyʼs plans to have upwards of 700 locations by 2015. (PRESS RELEASE) Austin, Texas, March 23, 2010 — Fast approaching its 40th birthday, Schlotzsky’s, the home of The Original™ round toasted sandwich, has decided to shake things up in a big way. The 350+ unit fast-casual restaurant has introduced an entirely new brand image that is attracting new kinds of guests and refueling franchise growth around the country. The brand reinvention, which is literally and figuratively “All ‘Round ‘Lotz Better,” includes a new prototype restaurant featuring vibrant colors, playful slogans, contemporary furniture and artwork, and a partnership with sister company Cinnabon that offers franchisees two brands under one roof. Schlotzsky’s also introduced a new service model where crew members hand-deliver food to the tables. Everything, from tables and chairs to circular-themed local photography featuring tongue-in-cheek phrases is contemporary and … round. The first new prototype model recently opened in Waco, TX, with eight additional new prototypes opening since and 15 more under construction. Plans are to have 60 of the new restaurants open by the end of the year and all existing restaurants to be reimaged by 2011. By all accounts, the strategic rebranding effort has been a success. It has led to a number of multi-unit franchise deals for 20 new franchise locations. And while Schlotzsky’s core customer base has remained loyal during the reinvention, the new image has also started attracting more female guests and a younger crowd. “Many of our longtime franchise owners see their bottom lines improving, and they see great things in Schlotzsky’s future,” Roddy said. “They are purchasing more locations and increasing their territories now while they see the opportunity is hot.” Roddy added that, ideally, Schlotzsky’s plans to have between 600 and 700 locations by 2015. The Cinnabon partnership is also contributing to Schlotzsky’s growth. The co-branding deal, which allows for freshly made Cinnabon Classic Rolls and other treats to be sold on the Schlotzsky’s menu, has been a huge hit, with more than 50 co-branded locations up and running well, and at least 50 more expected by the end of 2010. In fact, every new franchise deal that has been signed in the past six months has been for the combined Schlotzsky’s/Cinnabon model. To continue the growth momentum, Schlotzsky’s is aggressively targeting markets in Texas and in untapped markets around the country such as Kansas City, St. Louis, Raleigh, Charlotte, Atlanta and Florida for multi-unit developers. “Our entire team has worked extremely hard to bring the new look and feel to fruition and already the efforts are paying off, huge,” Roddy added. Since 1971, Schlotzsky’s has been the home of The Original™ toasted sandwich. The menu has evolved with customers’ tastes to include the highest quality sandwiches, pizzas, salads, and soups available today. With more than 350 locations worldwide, Schlotzsky’s is the fast-casual choice for a quick, healthful, and fresh dining experience. Schlotzsky’s is enjoyed around the world, with restaurants in Turkey, China, Saudi Arabia, South Africa, Costa Rica, Jordan and Kuwait. Schlotzsky’s is owned by FOCUS Brands Inc.®, the franchisor and operator of over 2,200 Carvel®, Cinnabon®, Schlotzsky’s®, Moe’s Southwest Grill® locations and Seattle’s Best Coffee® on certain military bases and in international markets. For more information, visit www.Schlotzskys.com. © 2010 Reed Business Information, a division of Reed Elsevier Inc. All rights reserved. To position themselves for success in a new business climate, chains are launching prototypes that deliver more than cosmetic changes. 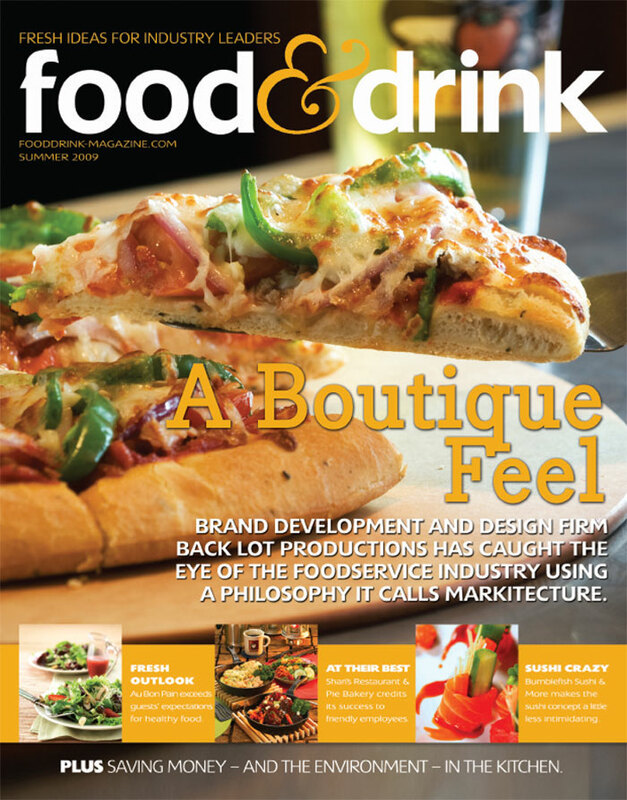 Every year, a new crop of restaurant chains rolls out prototypes boasting more-stylish and contemporary designs. But looks aren’t everything, especially in a particularly challenging business environment. These days, companies have broader goals in mind when it comes to makeovers. Some operators are launching prototypes that offer lower construction costs and and shorter build times to help get units up and operating more quickly. Others are creating new designs to help them achieve concept-specific goals, such as expanding retail sales, updating the brand’s image or better positioning franchisees for success. 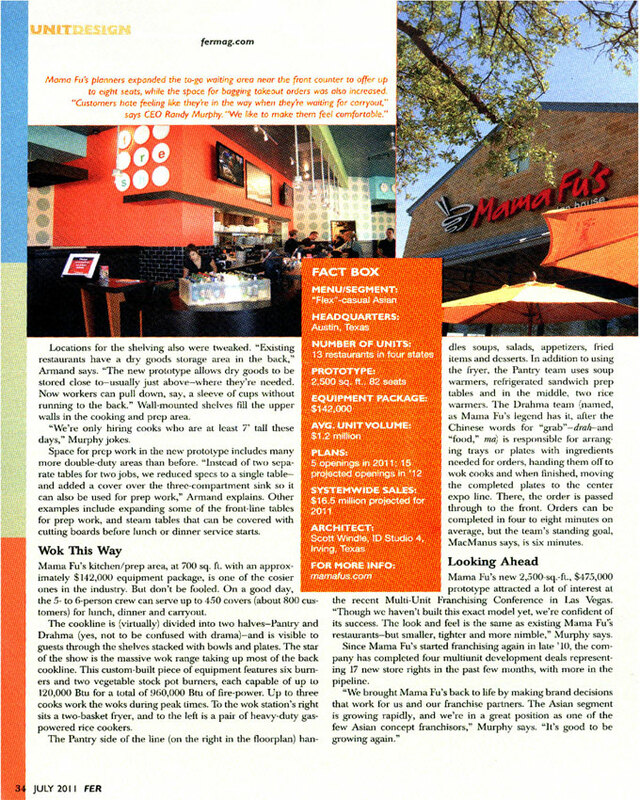 And whether the companies are Top 400 brands or emerging chains that already have lessons of their own to share, the overall objective is a shared one: “The main goal is to maximize sales per square foot,” says Randy Murphy, president and CEO of Austin, Texas-based fast-casual chain Mama Fu’s Asian House. Here is a look at some of the new prototypes across dining segments and the reasoning behind the renovations. Main goal: Cost reduction, a shorter construction timeline and the creation of a design that would better reflect the brand were the top priorities for President and CEO Randy Murphy, whose Murphy Adams Restaurant Group purchased the fast-casual-by-day, full-service-by-night chain last year. Biggest cost-savers: Replacing custom casework with pre-built units, achieving a faux finish on the walls with wallpaper and using faux wood for tables and wainscoting. Key design elements: The space is divided into two visual planes, with the section above eye level decorated in vibrant colors such as orange, blue and green and the area below in warm browns and woods with splashes of orange. 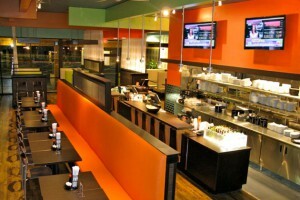 Higher-backed, Asian-inspired booths and sheer panels help separate dining spaces to create privacy. Other significant changes: The old 8-by-4 menu-board panels were replaced with 30-inch-by-30-inch squares that are less expensive to make and ship and that accommodate menu changes easily via the swapping out of plastic-coated papers in the cases. 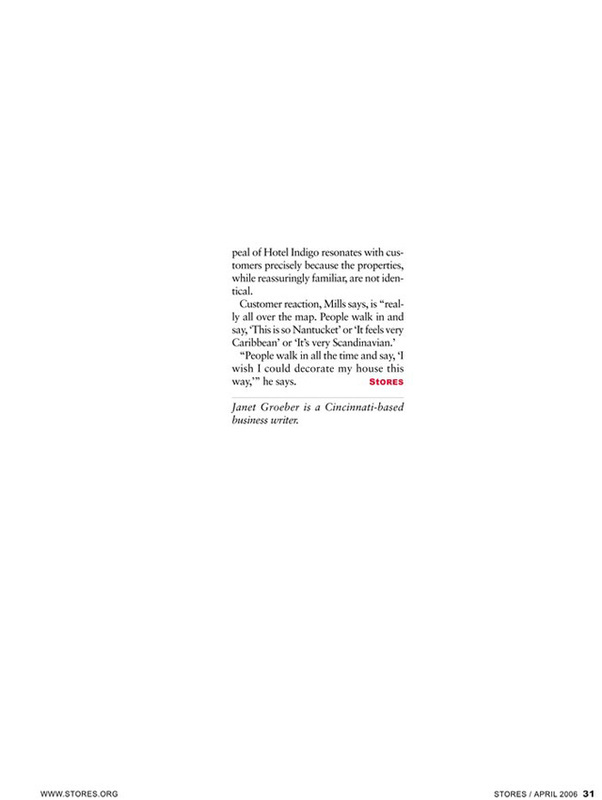 © 2009, Reed Business Information, a division of Reed Elsevier Inc. All Rights Reserved. 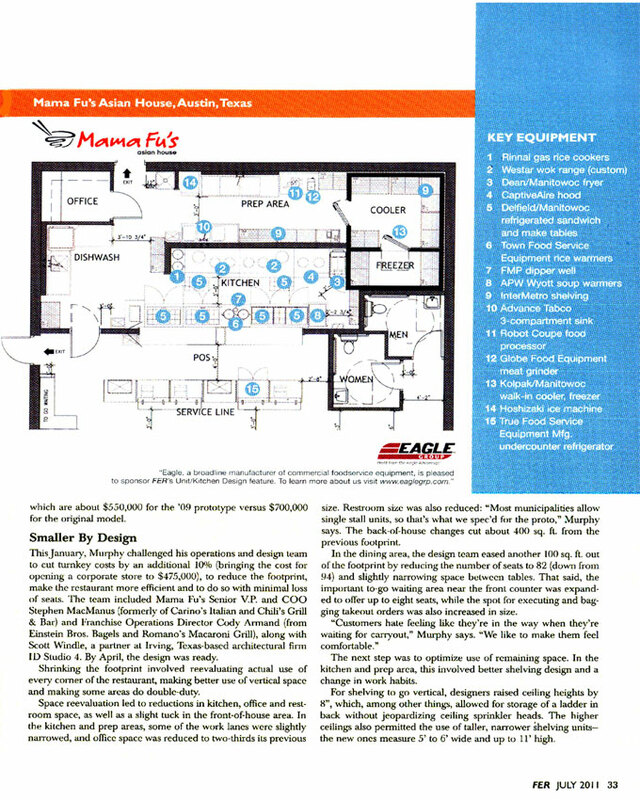 February 25, 2009 — Mama Fu’s Asian House developed a new, contemporary restaurant prototype that streamlines the construction process, enables franchisees to better serve customers, and radically reduces build-out costs. 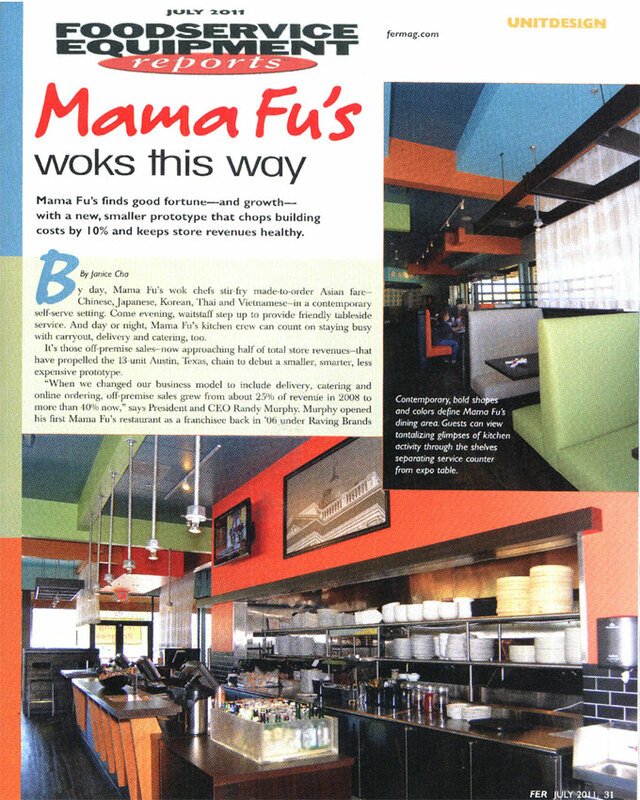 The new Mama Fu’s prototype includes more Asian-inspired colors, architectural elements, and décor. From tabletops and flooring to cabinetry, drapery, and wall coverings, the restyled Mama Fu’s provides a comfortable, beautiful, and more functional restaurant environment. 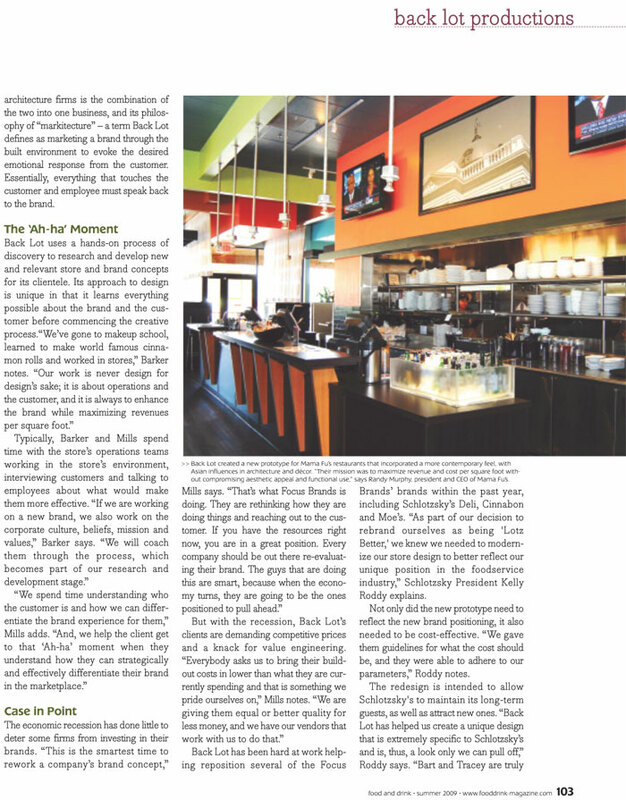 Cutting the time and cost of restaurant build-out were the company’s key goals in developing the new prototype. By making wise decisions about materials and opting for a modular design, Mama Fu’s franchisees will save roughly 20 percent in start-up costs, a dramatic reduction in build-out expenses. To ensure success in their efforts, Mama Fu’s engaged the expertise of Back Lot Productions, an Atlanta-based brand development and design firm. Back Lot utilizes a self-created philosophy called Markitecture, which is marketing a brand through the built environment to evoke the desired emotional response from consumers. “Building on our extensive experience in the retail and hospitality industries, we were able to further develop the Mama Fu’s brand and translate it through to all customer touch points,” says Tracey Barker, co-Founder of Back Lot Productions. The first Mama Fu’s location to don the new look is set to open in April at Wolf Ranch in Georgetown, Texas, with another new location opening soon after in New Braunfels, Texas. 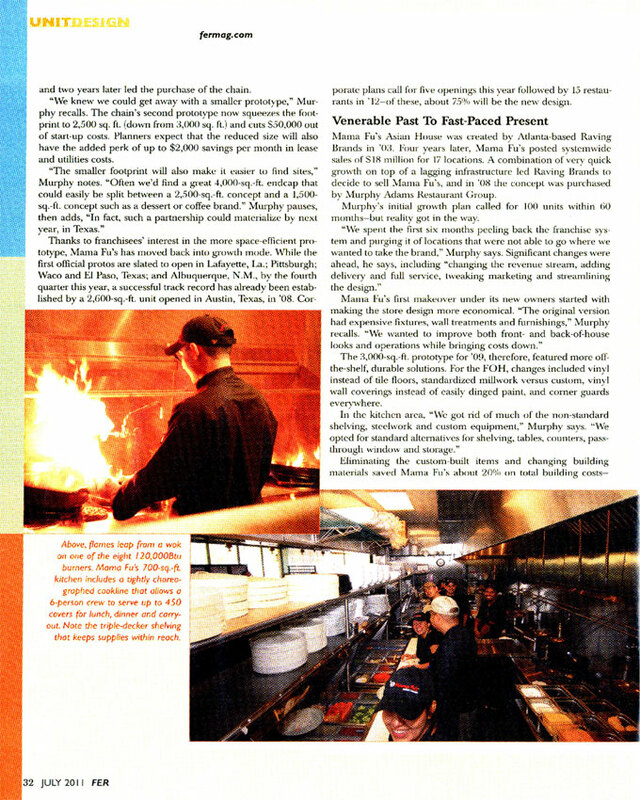 Among the fastest growing restaurant segments, Mama Fu’s Asian House is a unique “flex casual” service model with a fast-casual approach to lunch and relaxed, tableside dinner service. To some designers, the term limited service seems truly fitting. In many cases, designing hotels in the segment is characterized by financial constraints, stringent brand standards and a reputation for being way behind the design curve. But some designers consider the segment a welcome challenge—like a puzzle—and find creative ways to construct an environment that is distinctive and welcoming. 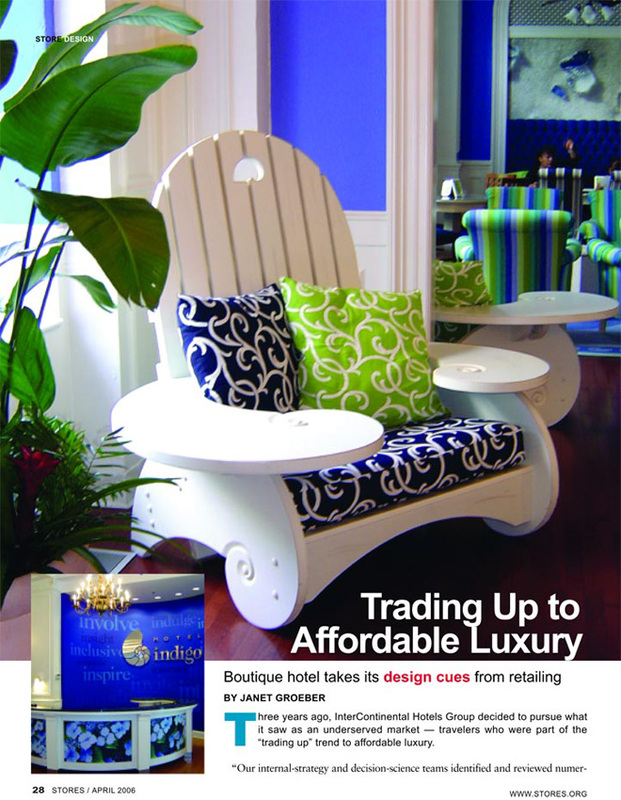 Although many limited-service brands want their franchisees to buy the package out of the box to ensure as much consistency from one hotel to another as possible, Barker and Mills created some options that would be better suited for urban hotels, as opposed to the roadside properties that are the majority among the Super 8 brand. This allows the designer to incorporate some regional concepts and a sense of place, which is unique for limited service, Valletta says. And, ultimately, the owner’s buy-in is crucial to the hotel’s success. While the Super 8 prototype has tested very well among Generation Next and baby boomers (the two target demographics), it’s the franchisees who were initially unsure about the new designs. Valletta says when the franchisees saw the prototype at the meeting in Las Vegas, some of them had questions. Super 8 unveiled a retromodern prototype guestroom design by Back Lot Productions, the design firm that worked on IHG’s Hotel Indigo brand. LAS VEGAS—Now is not the time for resting on success, according to John Valletta. Valletta, president of Super 8 Motels, a brand of Wyndham Worldwide Corp., shared positive accomplishments with attendees at the Super 8 convention in February. For starters, the brand moved from No. 5 to No. 3 in its competitive set in the 2006 North America Hotel Guest Satisfaction Index Study by J.D. Power and Associates. The brand also saw $100 million in increased revenue for fiscal year 2006. “We have made some changes, and it’s been paying off from your hard work and investment,” Valletta said. But changes must continue because expectations are changing. Valletta said by creating standards around product warranties, there hasn’t been franchisee pushback. Hirneise said breakfast was the most important hotel service to Super 8 guests. Rosanne Zusman, v.p. of brand marketing, emphasized the importance of the improvements. “If we don’t change, Super 8 as a brand will no longer be relevant,” she said. The marketing department set forth a multimedia plan. The brand will spend more than $5 million on a TV ad campaign and more than $2 million for online marketing, particularly on paid search, according to Zusman. “We will buy more than 100,000 keywords in 2007,” she told attendees. Super 8 also introduced a new Web site, www.Super8.com . Since its launch in September 2006, year-over-year revenue lift was 45 percent. Super 8 unveiled a prototype guestroom design that was described as “retro modern,” by the design firm Back Lot Productions, which worked on Hotel Indigo, IHG’s lifestyle brand. With robin’s egg blue on the walls, regional headboard wall art and wood laminate underfoot, the Super 8 “retro-modern” prototype steps away from the typical look of limited-service. 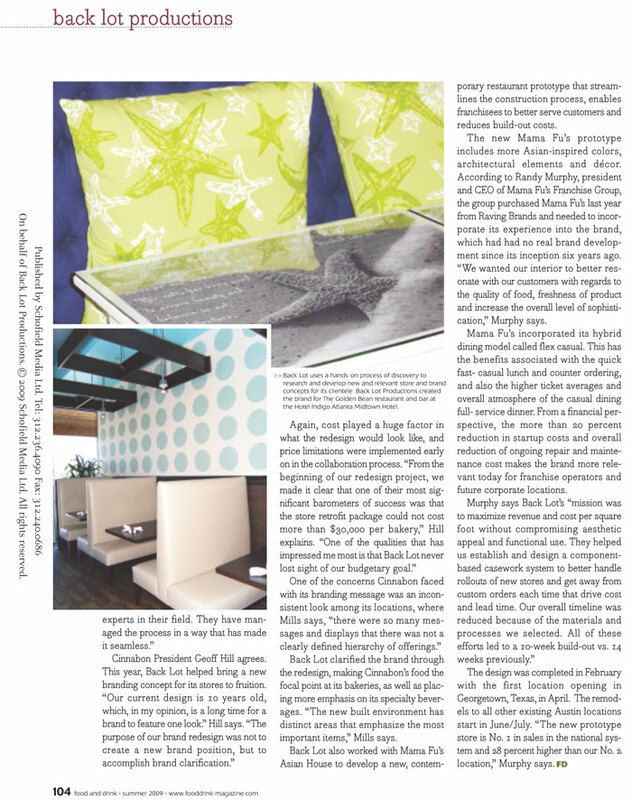 Valletta and Zusman said in an interview that an aspect easily brought into any guestroom would be the paint color. They planned to establish a short list of requirements. The bed has a striped, two-sided stain-resistant cover and a platform construction. The bath features a simple, yet unique two-tiered vanity, and an “8” themed tub surround. Pamela Amante, owner of the Super 8 Motel in McCall, Idaho, said it’s nice to see the brand get on track with improvements. Her property is making a 30-room addition with a pool. Victor Solia, who owns and operates two properties with his wife, Rose, in Crystal Lake and Elgin, Ill., said improvements are good, but return on investment is a must. “I’d put in a gold faucet as long as there was payback,” he said. 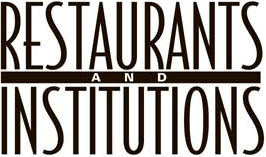 Copyright 2007 Advanstar Communications Inc.
What hotels do you remember most? In most cases it’s those whose architecture, stunning lobby or sheer elegance fixed them in your memory. Almost certainty, they are high end establishments—perhaps a Michelangelo in New York, the Savoy in London, or the Bellagio in Las Vegas. Now think of all the other hotels you’ve visited—why didn’t they resonate with you? In all probability you were subjected to a beige, non-descript lobby and remarkably unremarkable room. Enter Hotel Indigo, a mid-market hospitality concept with a difference. Created by the design team of Barton Mills and Tracey Barker of Back Lot Productions, an Atlanta-based brand development and retail design firm, Hotel Indigo revolutionizes the travel experience for those seeking a more relaxing and nurturing experience without the premium price tag. “This marks a departure from ‘hotel-beige’ properties, industry sameness and lack of a brand story,” said Kirk Kinsell, senior vice president, Intercontinental Hotels Group (IHG). IHG owns 3,500 hotels in over 100 countries, including such brands as Intercontinental, Crowne Plaza and Holiday Inn. The dynamic pair behind Hotel Indigo’s design and design strategy had already made its mark in the field of retail design. Mills, an architect by trade, and Barker, a graphic designer, originally joined forces seven years ago while building Hollywood Video into a national brand. Since then, they have worked together as Back Lot Productions on a variety of projects—most recently, Hotel Indigo. “We approached the Hotel Indigo brand design concept with storytelling, visual merchandizing and environmental principles that have worked well in retail design,” says Mills. 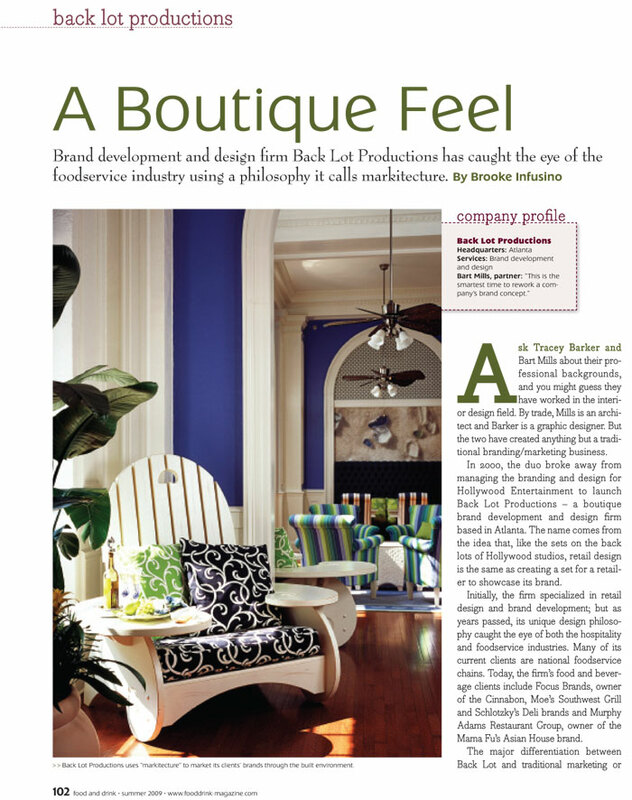 Back Lot’s design process always begins with discovering the “heart and soul” of the brand. Once determined, Back Lot carefully selects a design system that can translate that heart and soul into the built environment. That’s when the storytelling begins. “From that point, everything that touches the customer and employee alike speaks back to the brand,” adds Barker. 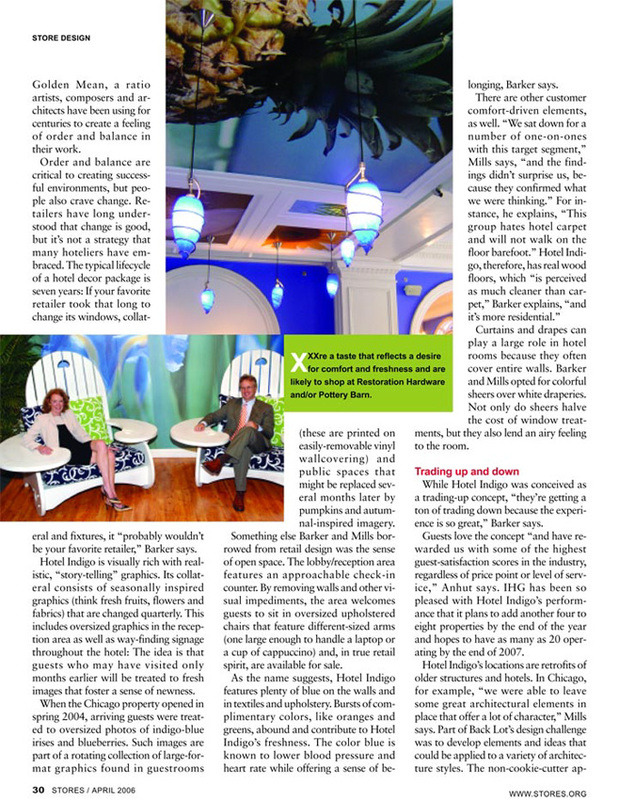 “It’s never design for design sake.” At the core is the hotel’s blue/indigo color scheme, along with open plan layouts to invoke the outdoors, wall-sized murals in each room, custom designed furniture, a musical score and retail design concepts such as quarterly change-outs of reception art and signage to keep things fresh. It all starts in the lobby, which is starkly different from typical hotels. Pergolas are utilized to bring the outdoors inside. The result is an inviting open-plan look that very much goes against the grain of today’s compartmented mid-market hotel space plans. But it’s the rooms themselves where people stay, and it’s here the designers have introduced some startling changes. Gone are wall-to-wall carpeting, mass-ordered bathtub units and boring beige. In its place: hardwood style flooring and glass spa-like showers. Perhaps the biggest “wow!” factor is the giant photo mural in each room. Taking up the entirety of one wall, they feature over-sized and impinging images, each one speaking back to the brand in its own way. A few examples include giant blueberries, huge mosaics of beach glass, and four foot tall indigo iris blossoms. June 8, 2004—InterContinental Hotels Group (IHG), the world’s largest and most global hotel company, today unveiled its new retail-inspired design and service concept for Hotel Indigo™, a new lodging alternative for the traveler seeking a refreshing hotel experience. Based on marketplace trends, IHG used Cohort Research in combination with Simmons data to define and identify this “trading up” segment for the lodging industry and determined that more than 20 million U.S. households fit this profile. The design and service model of Hotel Indigo was created specifically to address critical attitudes of this segment that identifies itself as value shoppers, non-conformists and décor enthusiasts. 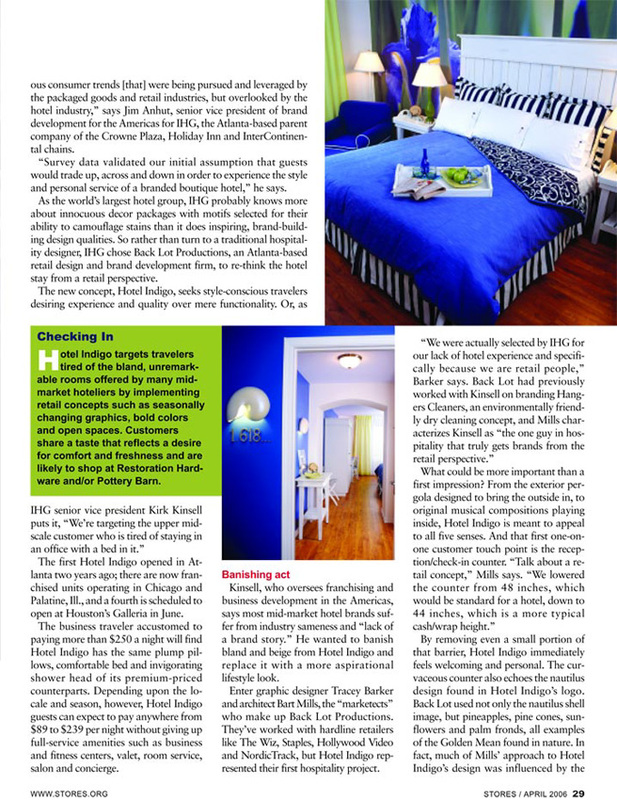 Forging a partnership with another brand based on renewal, the first Hotel Indigo will feature a preview of This Old House paint from ICI Paints. Well known and respected for its renovation skills and design savvy, This Old House also is developing an Hotel Indigo color scheme for a new This Old House paint line which will be available to consumers in the near future. Extending the retail model from design through service, Hotel Indigo guests will be welcomed into an accommodating environment that helps them create an experience suited to their own lifestyle. A non-traditional front desk structure allows staff the flexibility to move throughout the property greeting arriving guests, as well as providing customers with the option of checking themselves in. The bistro’s seasonal, health-conscious fare can be prepared ahead for the time-conscious traveler who wishes to eat in his room or for those who wish to relax in one of the hotel’s signature oversized lobby chairs. Designed with the single traveler in mind, the chair creates a personal work or dining space within the public areas of Hotel Indigo. A brand developed primarily for conversions, Hotel Indigo is designed to fit a variety of markets in locations where a hotel might not be reaching its full potential. 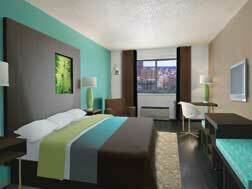 The first Hotel Indigo is scheduled to open in Atlanta, Ga. by the end of 2004 and will have approximately 140 rooms. The brand has a growth potential in high profile urban and close-in suburban markets like Chicago, Miami, Boston and Los Angeles. For more information on Hotel Indigo, please visit www.hotelindigo.com.